The Yacker Tracker® appears to be a traffic signal, but actually signals too much noise. Select the appropriate sound level for any given situation and let the Yacker Tracker® be an audio-visual reminder when the noise level gets too high. Roll your mouse over picture for zoom in option. 1 Yacker Tracker, AC Adapter..
1 Deluxe Yacker Tracker, AC Adapter, 1 Remote Control with 2 AAA batteries. Equipped with longer lasting LED lights eliminating the need for replacement bulbs. Features 2-second delay before the optional siren sounds preventing false alerts resulting from sudden noises. Acceptable levels of noise can be adjusted for quiet activities or louder for group work. Nursery schools with hearing impaired students can use the unit as a visual signal. Drama departments can incorporate this unit as a quiet signal to alert backstage cast members of inappropriate offstage noise. Other features include: voice ("Quiet Please") or siren options; Automatically or manually adjustable lights; Decibel sensitivity control (from 50dB to 110 dB); Self-standing or wall-mountable; Powered by a 120V AC adapter (Included) or 6 AA batteries, sold separately. Optional face stickers for lights. • Traffic light is approximately 17" high. • Unit plugs into AC 120 volt electrical outlet with included UL approved transformer (Input: 100-240V AC 50-60Hz, Output: 9V DC 500mA) or can be used with 6 AA alkaline batteries (sold seperately). • Unit can be self-standing or wall-mounted. • Traffic light is computerized with adjustable sound level meter. • Red light counter registers each time the red light activates. Push reset button to reset counter to zero. • Decibel sensitivity control can be set to operator's choice. Push button to devrease sensitivity. Also offers manual operation option of staying on a given light color. • Option face stickers provided to add the element of emotion ot the lights. • Green light stays lit until noise in room goes above set level (determined by user, green light is replaced with a flashing yellow light as a warning. When sound level reaches 15 dB above set level, the red light and siren are activated. • Voice ("Queit Please" in 4 languages or your own recording) and siren otions. User has the option of turning sounds on or off. • Delayed Alarm Function will sound when noice continues for more than 2 seconds. Need more than one? Yacker Tracker and Deluxe Yacker Tracker can be ordered in boxes of 6 at a 5% discount, or for a larger discount get 2 or more boxes of 6 Yacker Trackers and enjoy a 10% discount. Replacement remote for Deluxe Yacker Tracker®. Whether you need a replacement or an extra remote for a second station or supervised use by others, you can order now or when you need. Please NOTE: The Remote ONLY works with LED lighted Deluxe Yacker Trackers. Please contact us if you have any questions. Order yours today for only $15.00 + $5 Shipping.. Replacement Power Adapter for Deluxe Yacker Tracker® & Yacker Tracker®. Unfortunately, we no longer have Replacement Power Adapter for the older 'Light Bulb' version Yacker Trackers. All units we sell now are LED lighted. We sincerely apologive if this causes any inconvenience. We ONLY have and sell the adapters for the new LED lighted model Yacker Trackers. We no longer carry the adapters for the older Light Bulb lighted Yacker Trackers, sorry. 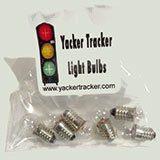 Replacement Light Bulbs for Deluxe Yacker Tracker® & Yacker Tracker®.. Please NOTE: All current Yacker Tracker units, both the Original Yacker Tracker and the Deluxe Yacker Tracker are manufactured with and only use LED lights; they do not require bulbs and therefore have no need for replacement bulbs..
Yacker no longer sells replacement bulbs directly. We have a few different sources we have found reliable that carry the bulbs for the Yacker Trackers units made with bulbs. #428 Miniature Bulb E10 Base - 12.5 Volt .25 Amp 3.125 Watt G4-1/2 Miniature Screw (E10) Base, 2.40 MSCP, C-2V Filament Design, 250 Average Rated Hours. 1.06" (26.90mm) Maximum Overall Length (M.O.L. ), 0.55" (14mm) Maximum Outer Diameter (M.O.D. ), 0.72" (18.30mm) Light Center Length (L.C.L. ).